The adage “Safety First” has been tossed around in today’s lexicon so often, that for many, they are simply words with little or no meaning. For law enforcement across the board, safety should be at the forefront of everyone’s mind when it comes to handling potentially-deadly evidence, such as fentanyl and carfentanil, and other drug-related paraphernalia. In Pulaski County, for example, a change in the sheriff office’s policy put a halt to field testing, and suspected substances are now sent off to a lab for analysis, Pulaski County Sgt. Glen Bland said. “If (deputies) are confident they have a charge of first-degree controlled substance, charge the (suspect) with ‘drug unspecified’ and get it tested at the lab,” he said. That practice is the best practice, Department of Criminal Justice Training Instructor Shawn Moore said. Moore and fellow DOCJT instructor Chad Powell began teaching the Property and Evidence Room Management Course in 2017. The practice of field testing substances is no longer taught, he added. “The benefits of field testing pale in comparison to the dangers associated with fentanyl and carfentanil exposure,” he said. If officers encounter suspected fentanyl or carfentanil, they should be kept in the container they were found in, Moore said. 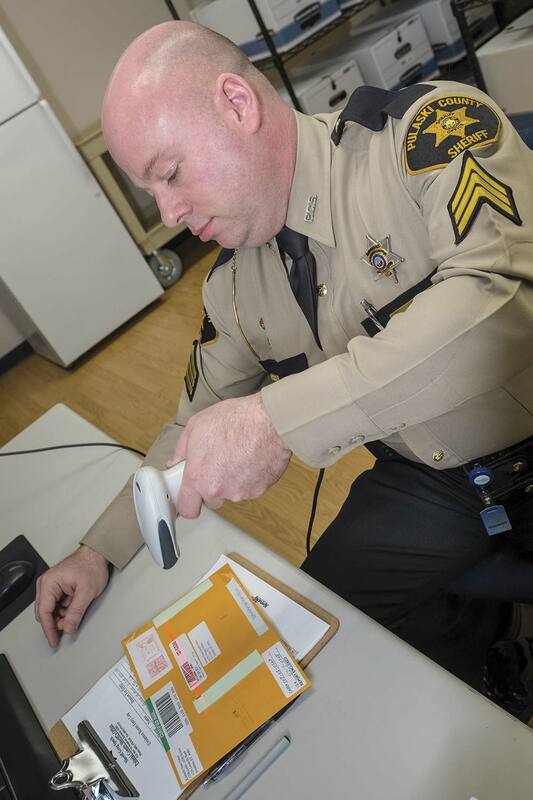 As a safeguard to potential exposure during processing, the Pikeville Police Department has Narcan available to officers in the evidence room, Pikeville Police Detective Bruce Collins said. In addition to the life-saving drug, Collins said a drug-screen measure was put into place to protect the officers who may come into contact with drugs while performing related evidence room duties. In addition to those dangers, Powell said having the basics such as a first-aid kit, Narcan and an eye-wash station should be a part of property and evidence rooms standards. Shortcomings in this area could result in fines from the Occupational Safety and Health Administration or Kentucky Occupational Safety and Health, Moore added. Aside from officer safety, evidence-room security and tracking are nearly as important. When he took over in 2012, Collins said he noted several areas he and the department could improve upon. The most glaring need was a modern tracking system. “We went from a paper-tracking system to a digital (barcode) evidence-tracking system,” Collins said. Once officers package the evidence, they enter it into the PMI (Progressive Microtechnology, Inc.) Evidence Tracker software and then place the evidence into a temporary storage locker, Collins said. Having an automated system streamlines the process, Bland said. “I’m confident this is a widespread problem throughout the state, but you have evidence that has lingered for decades and it’s still logged in under the old hand-written log that has long since been obsolete, but that evidence was never transferred to the new (automated) system,” Bland said. “That’s what I ran into (in 2015). I had evidence that I really had no idea what was recorded on the evidence itself to understand how long we’ve had it. “Your evidence room will only be as good as the (tracking) program you have,” Bland continued. Pikeville uses temporary storage lockers when patrol officers turn in evidence collected in the field. Evidence remains in the temporary storage locker until Collins comes in and processes it using the tracking software. “It shows me how many items have been entered, and I check the locker and inspect it and make sure it is what it is supposed to be and make sure there are no errors (in packaging),” he said. After everything checks out, Collins will accept the evidence and a barcode is produced. Every piece of evidence for that case will have a barcode. Once a tracking system is in place, security comes into play to ensure the chain of custody is not compromised, Moore said. “One of the easiest ways to protect the integrity of the evidence and maintain the chain of custody is to limit the number of people with access to the property and evidence room,” he said. The first and perhaps easiest step is making sure the property and evidence room remains locked and secure. In Pulaski County, the property and evidence intake room requires a code to enter. The primary evidence room requires both a code and a card to gain entry. On top of that, surveillance video monitors the rooms. The Pikeville Police Department has limited the possibility for an officer to take money from the evidence room altogether, Pikeville Police Capt. Aaron Thompson said. The money stays in the account until the court decides who it belongs to, Thompson added. Pulaski County handles currency differently, but it is no less effective, Bland said. “Money and valuables are stored in cabinets, which are coded and alarmed,” he said. Security is something that shouldn’t be skimped on, Moore said. An additional security measure comes from required audits. Regular audits are much like a medical checkup in that they are designed to prevent problems before they happen, Powell said. Pikeville’s audits are unannounced and the tracking program initiates them. Audits also provide documentation that the agency is on the up and up, Thompson said. With the exception of money, drugs, firearms and biologicals, Powell said the evidence room contents should be audited on a yearly basis. 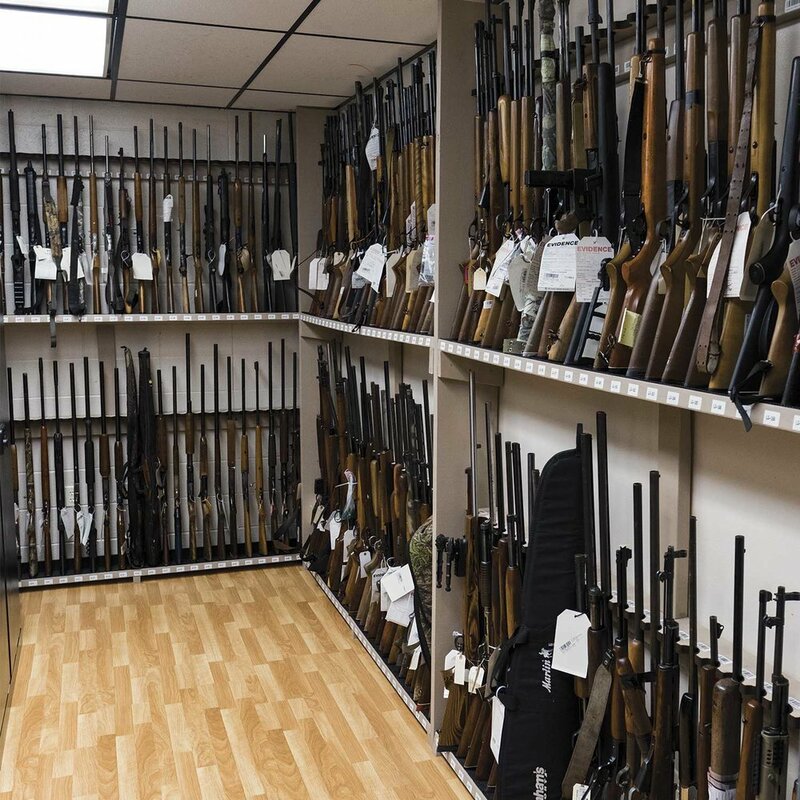 Items such as firearms and money should be audited on a quarterly basis. Operating a top-notch property and evidence room is a vastly underrated aspect in law enforcement, Moore said. “When it comes to property and evidence room management the old adage ‘An ounce of prevention is worth a pound of cure’ can be applied in all areas,” Moore said. “The importance of taking a proactive approach to the various situations and concerns unique to property and evidence room management cannot be overstated. Through new tracking software, safety and security measures, as well as updated policies and procedures may come with some upfront costs and inconvenience — in the end — the headache it can save an agency pales in comparison to the liability that comes with ignoring these areas.